The Glass Bees are a means to indeterminate ends. 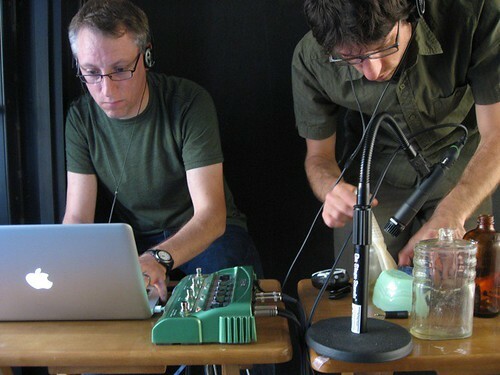 Begun as an attempt between friends to create improvised music, the project has evolved into a malleable platform for experimenting in sound and other media. It is a method for engaging with collaborators, for experiencing and interacting with locations in attentive ways, and for exploring the independent publishing opportunities offered by the Internet. Started in 2006, the Glass Bees have posted more than 80 recordings as an ongoing free podcast on our website. Our approach is not focused on composition, but emerges from a spirit of play and a personal vocabulary for exploiting the creative potential of musical instruments, field recordings, nonmusical objects, voices, and situations. We record our improvisations, edit them in ways that strike us as interesting, and share our discoveries through our website, largely dispensing with traditional models of recording and distribution. Over time, we have found that the methods that we developed in the studio can be applied to a variety of environments and media. As we have evolved, field trips, video, plein air watercolor sketching, photography, live performance, and conceptual mixed media installation have all become important elements in our work. This has enabled us to move out of the studio and to integrate other interests, leading to more ambitious conceptual projects such as “Venice, Brooklyn“ and “Reading Governors Island“ that have focused on issues of place, history, science, and culture. This approach has also suggested site-specific strategies for collaboration that incorporate environment and audience participation. In all of these projects, our approach has been to place ourselves in novel situations, to make use of materials at hand, and to cooperate in ways that lead to unexpected results. At least as much as the final composition, we are interested in the process of discovery that takes place along the way. Currently, the core of the Glass Bees is Chris Williams and Jason Das. Sound artist Andrea Williams (no relation to Chris) was also a regular member in 2008-2009. On several occasions we have joined Ranjit Bhatnagar in performances that utilize his incredible homemade instruments. Other collaborators have included video designer Peter Shapiro, electronic composer Blevin Blectum, and California recluse Meth Jive. Our music has also been featured in short documentaries by filmmaker Nerina Penzhorn on artists Chico McMurtrie and Mary Lynch, as well as an animated short by Greg Harrison. The Glass Bees have performed or created installations as part of: Citydrift 2012 at Bogart Salon (in collaboration with Melinda Hunt and the Hart Island Project), ConfluxCity 2009, FIGMENT 2010, the Forward Motion Theater’s Eyewash multichannel video-audio series at Monkeytown, the Optosonic Tea series at the Diapason Gallery, former e/i Magazine editor Darren Bergstein’s One Thousand Pulses series, and curator Aneikit Bonnel’s Art Social. Other venues have included Envoy Enterprises, Barbès, the 19ths Loft, and the Devotion Gallery. In 2008, we self-released a CD, titled Tops Crops Snaps Hots, which sequenced highlights from our early recordings into a continuous 63-minute mix.